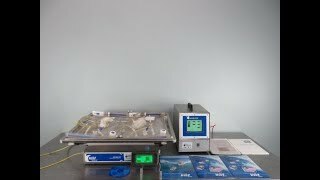 The GE Wave 20/50EHT Bioreactor System offers you a complete system for your benchtop bioreaction needs. This bioreactor is modular and can be expanded up or paired down depending on needs. On the 20L rocking platform, cell bags are agitated at 2 to 40 rocks per minute, and at an angle of between 2-12°, mixed with O2 and or CO2, and heated to specified temperatures. These parameters are controlled and monitored through the various attachments for this bioreactor. This GE Wave 20/50EHT Bioreactor System is an ideal choice for cell culturing, vaccination production, protein manufacturing, CHO cells and so much more. The GE Wave works in conjunction with various attachments depending on the complexity of control scheme that’s needed. Through use of a WAVEpod controls and monitors dissolved oxygen measurement, pH measurement, aeration control and O2/CO2 gas blending through one hub with a digital touch interface. This GE Wave 20/50EHT Bioreactor System has been tested for functionality and is operating without issue. Please note there is slight cosmetic blemish, pictured, however it does not impact performance. All of our lab equipment comes backed with our standard warranty. We're happy to answer any questions you may have just let us know!